LAWRENCEBURG, Ky. — The Kentucky National Guard’s annual Operation Military Cheer got some additional help this year from a famous Kentucky company. As a part of its #P8TRIOT campaign this season, Ale-8-One partnered with Operation Military Cheer to donate to the American Legion Auxiliary Anderson Unit 34. Ale-8-One team members visited Patriot Hall in Lawrenceburg, Kentucky, on Dec. 9 to bring the toys and of course, cases of Ale-8-One for the volunteers and families. On-site to greet the Ale-8-One team members were members of the Kentucky Guard and the American Legion Auxiliary. 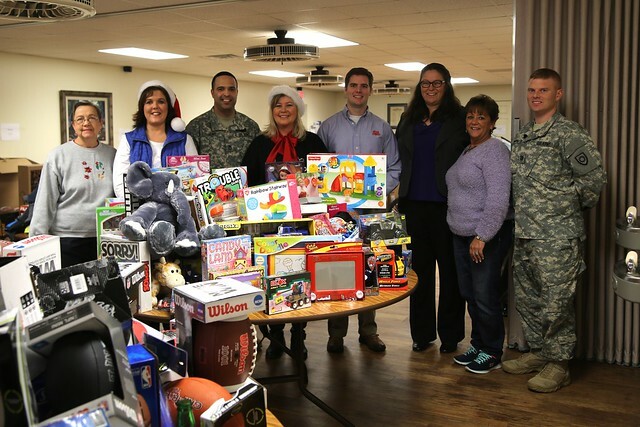 The toy drive was part of an effort by the Kentucky National Guard’s Family Assistance Center to ensure that the children of Kentucky’s military families across all of the uniform services – active duty and reserve, Army, Navy, Air Force, Marines and Coast Guard – have a memorable holiday season. Contributions for this year’s drive came from a wide range of sources, local businesses, civilians, churches and schools as well as Kentucky National Guard troops and their families.